Stone in front of Newgrange, Ireland. Photo provided by Wikimedia. Before we continue on with the alphabet….. another kerb stone from Ireland. Newgrange, Ireland is a large pre-historic monument called a passage tomb. It is older than the Great Pyramids. In front of it sits what is called a kerb stone adorned with Neolithic art. Most people who look at this stone see pre-historic graffiti despite the fact it is sitting in front of a spectacular building. Notice on the far right there are actually two squares above a shape like a mountain. There is a swirl shape above which is perhaps a cloud? Notice at the top center a vertical straight line. Perhaps a pole? Could this be a story which reads right to left. Does it say two daggers struck a mountain from the clouds above?Everything turned and churned at the pole. There was more turning and churning as more daggers ricocheted from the pole. Could it be possible there is more written here in a language we were meant to understand? Could this be a message written in math? There are three large swirls followed by six swirls. Most could read the message that far. 3 and 6 as in 36 or 3 + 6 = 9. But all of the 6 swirls are not complete. There are 4 complete and two partial. Then that is 2, 4 or 24. Or it might be 42. These numbers 24 and 36 bring to mind hours in a day and seconds in an hour? Degrees in a circle? Putting them together we might come up with 324 or 342? 324 is the square of 18 while 342 is the square of 18.5??? The Earth has an orbital diameter of 186 million miles. Perhaps it is just 32. The square of 5.65 is 32. So we might say 5.65 is at the pole or 56.5? But the stone begins with 4 squares on the left and notice there are 4 shapes on the right. So our series has become 4364 which is the square of 66. The Earth moves about the Sun at the rate of 66,622 miles per hour. How delightfully co-incidental of them to doodle in such a scientific manner!!! But wait! The four squares on the left are grouped as if they should be read 1 3 so now our string of numbers has become: 1 3 3 6 4 which might be said to be 13364 ??? 1 3 3 6 1 3 or the square of 365.5 or very nearly the number of days in a year 365.24. But there are two key numbers missing…the diameter of the sun 864,000 miles and the diameter of the Earth 7920 miles. The first four squares plus the large three circles equals 7. The 3 swirls followed by the 6 equals 9. The 6 swirls are followed by 4 shapes or 10. So perhaps this is 7910!! What of the diameter 864000? The radius is then 432,000. We have the 4 squares, 3 swirls and then 2 swirls or 432. This looks remarkably like the radius. Taking one last look at the stone we see on the right side: 1 cloud, 1 mountain and 2 dagger/squares for 112. Twice 56 is 112. It might be concluded that it says the pole is at 79.10 degrees and at 56.5 degrees. Surely, the magnetic pole used to lie close to N 56.5, W 79.2. Back to other posts on kerb stones. On to the next post on the Indo-European Language. Back to the last post. Did Neolithic Artists just Doodle or Did They Draw with Intelligent Intent? Neolithic art is something we do not spend too much time studying. We class it with ancient graffiti, decorative art, or a bit of bragging about the recent hunt. We do not really expect it to tell us anything in the way of communication of important ideas. If it does say anything, we assume they are simple messages from simple minded people and move on. An article by Dr. Philip Stooke in 1994, “Neolithic Lunar Maps at Knowth and Baltinglass, Ireland,” proposed that several works of art found in the Knowth Passage Mound, Ireland are images of the moon’s surface. Most of the art at Knowth and the nearby sites are an odd assortment of lines, swirls and dots. One stone simply depicts 16 circles. Then there is the other extreme. There is another stone so covered with markings it looks like a piece of overused doodle paper. 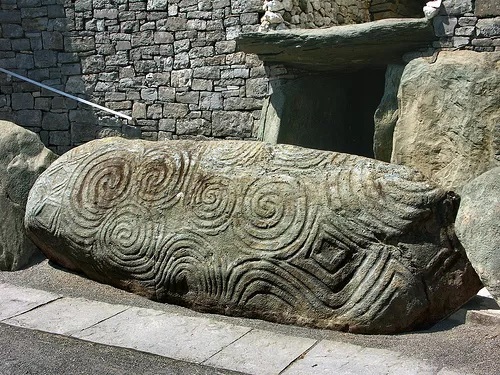 We are going to look at a few kerbstones found at Knowth, Ireland. These stones are some 5500 years old. The first stone to be studied is the aforementioned simple 16 circle image drawn on Kerbstone 42 depicted above. 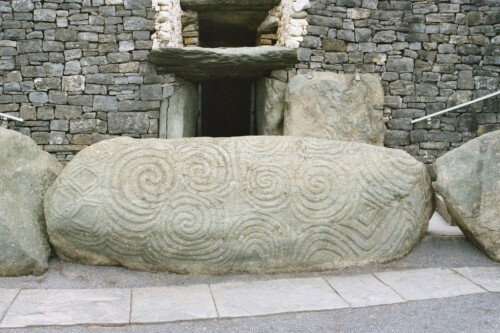 It is one of the 127 kerbstones at Knowth. Another author has proposed that these Neolithic artists counted their year in 16 months and therefore each circle is a month. It is suggested here the 16 circles simply represent the distance Earth travels in a day. ??? Yes. It travels 1.6 million miles on average in any given day. Now it would be logical for you to scoff and say these artists did not measure in miles, nor were they even aware the Earth moves or even rotates. Since we believed until quite recently in our own history that the Sun circled the Earth we assume they were as simple minded as we are/were. As far as measuring in miles, they left us another clue that they did measure in miles and perhaps we should hold up on the scoffing. That 16 is written as two pairs of 8 circles, the upper line and the lower line. 8 and 8 as in 88. We all remember that 88 x 60 = 5280 and that is how many feet are in a mile. There is a group of 6 in a neat array on the right side to remind us of 6 and 60 and the minutes in an hour. Before tossing the whole idea out as a sour apple we might note the left group forms 9 circles and the right group 7 circles. There are 2 lines of circles. 7, 9 and 2 ?? 792?? As in 7920 miles in the diameter of Earth? Yet we might say the left group has 8 circles in a neat square array and the right group has 6 circles in a neat square array as in 8 6. The Sun’s diameter is 864 thousand miles. But we have forgotten the one hanging out at the beginning and end. We could say we have a series 1 8 6 1 which looks remarkably like the diameter of Earth’s orbit at 186 million miles. Now we discover a second way to determine 5280 feet. Note that the group of 8 times the group of 6 times one on each end for 11 equals 8 x 6 x 11 = 528. There is an expected number still missing. The number 56 should appear in the message since this number consistently appears at ancient sites. 3200 is 56.56². The image has 16 circles. They are depicted in two lines. So we might say 2 x 16 gives us the 32. Recall that the Great Pyramid was constructed only 750 years after these tombs and it displays celestial measurements encoded into its structure. Knowth is a large earthen mass with two narrow halls that emit light into the structure. The pyramids are similarly designed. Perhaps you think this is too much knowledge for a stone age man to possess? The name of the place is Knowth which means “to know” and this only adds to the curiosity of it all. So, for a Neolithic doodle this one packs a powerful mathematical message. This artist has written in a language we can understand and yet we still do not trust our eyes. Very shortly we will look at Kerbstone 52, a much more complex doodle and that will really leave us wondering. Let us look at another doodle by a stone swinging Irishman – Kerbstone 52 from Knowth, Ireland. 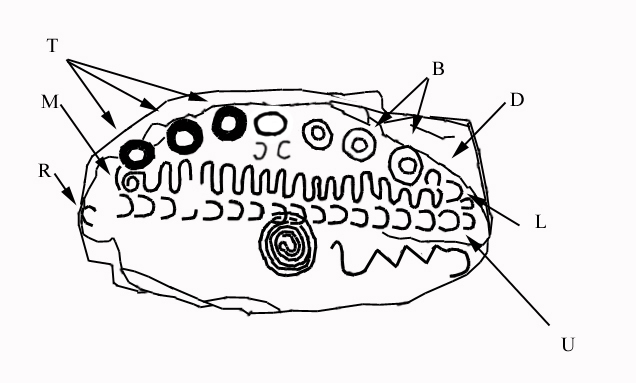 Knowth Kerbstone 52, sketch by BL Freeborn. The Knowth mound has a diameter 275 feet and has 127 kerbstones surrounding the base perimeter of approximately 866 feet. This circumference brings to mind the diameter of the Sun at 864,000 miles. Because we are discussing a circular mound the idea of pi comes to mind. 127 x pi equals 399. The diameter of the Moon is 2160 and that of the Sun is 864336 and this gives us the ratio of 1:400 regardless of the units used. So, now we begin a study of the petroglyph found on Kerbstone 52 as sketched in the figure. Dr. Philip Stooke suggests in his article that this drawing is of the phases of the moon as it exhibits several images we can easily associate with its changing appearance. However, even he admitted that these symbols really have little in common with the actual observed appearance of the Moon throughout a month. He noted that there are 29 phases depicted above and below the center up-down line. There are four circles marked T, three circles marked B, one up-side down crescent marked D, two left opening crescents or C’s marked L, 17 left opening C’s marked U that lie underneath in a straight line, followed by crescent R which is removed from the group and the cycle ends with the crescent marked M. A sum of these reveals there are indeed 29 symbols encircling the up-down line. There are two crescents below the circles in the middle. Not all sketches depict these two. At this point most people conclude the artist was not very gifted or a lousy observer and they move on. However, we shall be a little more determined than most so that we might prove the translation of the previous stone was not wildly co-incidental. Here we start by counting all the symbols. Because the one C is removed from the rest there is a tendency to get only 28. We see 28 x 2 = 56. This number 56 appears at Stonehenge. There are 56 Aubrey holes surrounding Stonehenge which are unexplained. It was the number found last in the previous kerbstone study. If the crescent marked R is placed with the 28 we obtain 1 plus 28 or 128 which is one more than the number of kerbstones. 128 x pi = 402 which reflects the ratio between the diameter of the Sun and Moon and the ratio of their distances from Earth, both of which is 400 to 1. If the crescents are counted as 29 and the two below are considered, then we have 29.2. Twice this number is 58.4. The distance earth travels in a year is 58.4 million miles. At the center is a spiral symbol. This can be translated to mean cycles, repetition, turning or the ecliptic. So perhaps we are looking for cycles involving the Moon, Sun and Earth. The up-down line has 16 cycles or 16 up and 16 down for 32. The square root of 32 is 5.65 which repeats the 56. Add the 16 up and 16 down to the 28 crescents and obtain 60 for minutes and seconds. Now we might notice that the 22 crescents surrounding the line plus the two C in the middle create 24 as in hours in a day? These are both cyclic numbers. We look again at the image and see the circles may also represent the Sun not only the Moon. We count 4 T circles plus 3 B circles and the 2 crescents below the circles. 4 3 2? The radius of the Sun is 432,000 miles or multiply by 2 and obtain 864, the diameter of the Sun at 864,000 miles. Notice those two crescents below the 7 circles which are back to back. 1 and 1 as in 11. Note that 11 seems to have special meaning in two ways. The first is symbolic suggesting One God. 11 x 11 = 121, 111 x 111 = 12321 and 1111 x 1111 = 1234321 which is rather unique feature of 1 or 11, and might indeed impress someone with its holiness. It may simply mean the sum of 5 + 6 = 11. If we multiply the 11 by the 7 circles above we obtain 77. As 7.7 it is the square of 2.77. Dr. Stooke noted the 29 correlates with the number of days in a lunar month. Here is the thing. The lunar month is not a fixed number like the Earth’s year. It varies. The longest period of time between full moons is about 29.72 days. On the average today it is 29.53 days. So here is the trick. Start counting these 29 symbols at the left circle T moving clockwise and upon completing the circle pause and then recount the 7 circles to obtain: 29 pause 7 or the 29.7 days of the longest average month. Or proceed in this manner. Begin at the same spot counting clockwise 29 pause, count 4 T pause, and conclude with 3 B circles. So that now we obtain 29.43 or one of the shortest lunar months. Or find the Sidereal Lunar month by counting all 29 symbols and then add the 32 (16 up/downs) to create 29.32 but this is off by two days. The actual value is 27.32 which we can obtain if we subtract the 2 upper middle crescents. The 29.7 is a unique number in that if it is read in reverse it reads 7.92 or the diameter of the Earth 7920 miles. The diameter can also be obtained by noting the 7 circles, add the 2 middle crescents for 9 and then the 22 remaining crescents for 7922. There are 7 circles in all. What is the probability each circle represents a day or a 7 day week? If they used a seven day week, would we not find 52 weeks represented? Begin at those 2 middle crescents, add the seven circles and then add the 22 remaining crescents to obtain 2 7 22 or 2722 which is the square of 52.17 or the weeks in a year. This 2.722 nearly gives us the 2.77 we have already discussed. The diameter of the moon is easily found. There are 2 L’s and 16 “cycles” on the up-down line which gives us 2160 mile diameter. Or from the reverse direction R and M followed by the 16 cycles gives the same 216. The 16 ups and downs also reminds us the earth travels 1.6 million miles in a day. This idea is further illustrated by the left end of the line which curls round like the earth turning in a day. We may further suggest that the up-down line describes something that goes up and comes down because of gravity. The sum of 16 + 16 = 32 and that reminds us of 32.17 ft/sec² of gravity. Which then makes us look at those 17 U’s beneath the line to create 32.17. The 1 R crescent followed by the 17 U’s creates 117 which is 2 x 58.5. This brings to mind earth’s circumferential orbit each year of 584 million miles found previously. The 17 U’s are significant. They may represent the 173 AU that light travels in a day or the 17 minutes it takes light to traverse the diameter of Earth’s orbit. This makes the up-down line a symbol of light traveling which, ironically, is pretty much how we symbolize light traveling today. So, this is one very complicated mathematical message after all! But is it remotely possible these stone wielding cave men knew anything of science? Recall that the Pyramids are considered to be some 4800 years old and that many people have found values which represent Earth and Solar System measurements designed into its structure. Knowth is some 500 to 700 years older than the pyramids which is a reasonable period of time to develop the engineering skills to step from building round monuments to monstrous pyramidal monuments. 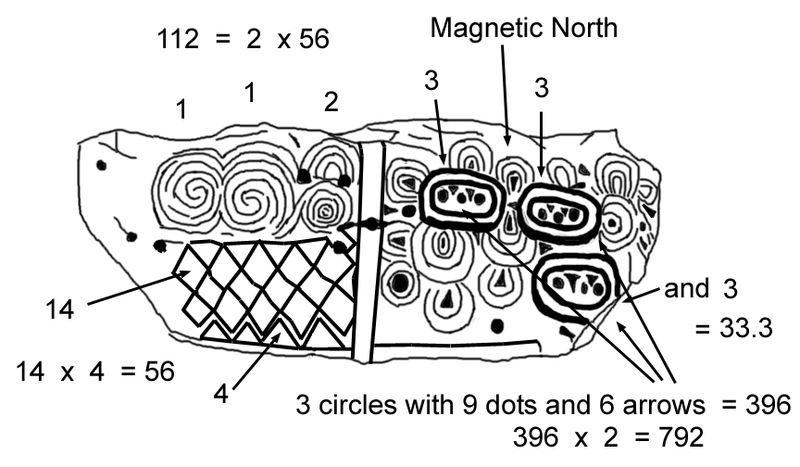 Newgrange kerbstone 52 is a beautiful mathematical message as well as a depiction of an event. The left side of the stone depicts the number 56 twice as shown. This simple number, 56, has a way of appearing at all these ancient sites. The right side has three bold ovals each containing three dots which creates the number 33.3. This number is also part of this mystery. These three bold ovals contain two triangles (or arrows) each and three dots. Three ovals, 9 dots, and 6 arrows creates the number 396. The radius of the Earth is 3960 miles. Its diameter is then 7920 miles. Notice the place marked in the sketch as magnetic north. The pattern depicted between the two ovals is what appears when a piece of paper is sprinkled with iron filings and a magnet is placed beneath it. So they indicate magnetic north by this realistic depiction. We may understand the two adjoining ovals to be the two hemispheres of the Earth shown joined at the pole. Note the bold dot directly below this point. We may speculate that an object moves towards earth. It draws closer and a coma or tail forms. They depict an impact at the pole as was suggested by art on other kerbstones. This drawing however goes further. They are suggesting by the ornate pattern multiple impacts. Now we may interpret the 3 bold ovals as impact sites with multiple impacts within each site. The petal style then portrays impact ejecta that fanned out from the initial craters wrecking maximum havoc. Or perhaps we should interpret it such that previously there was one Arctic Circle as shown in the bottom right which became two! – two places to measure from as in magnetic north and true north! Delve into more posts and then decide.